air joe is proud to serve the Schaumburg community! We are proud to be a part of this community, serving your heating and air conditioning needs: air joe is listed in many directories under titles such as : Schaumburg Heating Contractors, Schaumburg Heating, Schaumburg Air Conditioning, Heating Repair, Air Conditioning Repair, Schaumburg Heating and Cooling Contractors, Rooftop HVAC Repair, Ductless AC Systems, Boiler Repair and Schaumburg Heating and Air Conditioning Contractors. We are here for you whether you need furnace or air conditioner repairs, heating and cooling estimates, equipment replacement or new installation of a furnace, air conditioner, heat pump, rooftop heating and cooling or comfort products to improve the air filtration for your home or business. The Village of Schaumburg is located in Cook County, Illinois, approximately thirty miles northwest of the city of Chicago. Schaumburg’s transition from sleepy rural community to a major commercial and retail hub was facilitated largely through the efforts of local developer Alfred Campanelli, who designed and built the village’s first residential subdivision in 1959. Situated within Chicago’s “Golden Corridor,” the village is home to a population of more than 75,000 residents, as well as a number of national and international corporations that include Motorola Solutions, Comcast, and Genworth Financial. 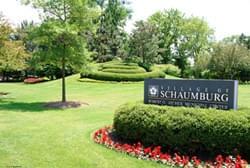 Schaumburg enjoys a humid continental climate that produces rotating seasons of hot humid summers, cold wet winters, and lovely moderate weather during spring and fall. Schaumburg offers a variety of recreation and entertainment opportunities for the enjoyment of residents and visitors alike. Popular pursuits include shopping at Woodfield Mall, one of the nation’s largest indoor shopping malls featuring more than 300 stores and a variety of dining and entertainment establishments that include Jimmy John’s Gourmet and the Improv Comedy Club. For outdoor lovers, the Ned Brown Preserve offers 3,500 acres of forestland and water featuring nature walks, picnicking, fishing on Busse Lake, and hiking and biking on the numerous paths and trailways that meander throughout the preserve. The Village of Schaumburg loves to celebrate and features a number of festivals and special events each year. Celebrations of note include the Prairie Arts Festival, Great Northern Bluegrass Festival, and Septemberfest, a popular three-day carnival/festival that attracts more than 250,000 visitors annually with amenities and activities that include fireworks, musical acts on three stages, an arts and crafts show, and more! No matter what your pleasure, the Village of Schaumburg has something for everyone!